Travelling within Pune just got a lot more affordable – fire up your Uber app, request a POOL ride and off you go. No promo code needed! 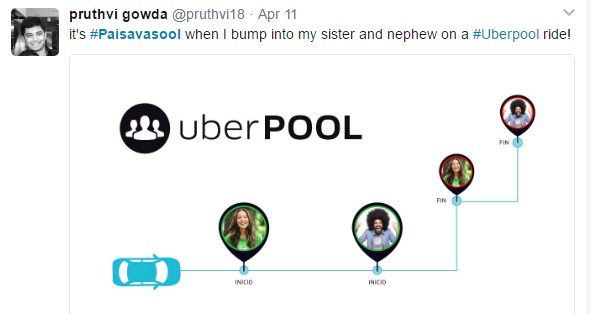 All POOL rides will be available at a flat fare of ₹49 up to 8 kilometers. Enjoy ride sharing as we make this POOL party bigger and better! You will be shown an upfront fare of ₹49 for the destination entered. Offer is applicable for rides of up to 8kms distance only. Each request can have a maximum of 2 riders per pick up. Pro Tip – Request only when you’re ready! As a courtesy to your co-rider, your driver will only wait for 2 minutes. Flat fares are valid only on uberPOOL rides upto 8 kms in Pune. uberPOOL is available everyday between 7 am and 10 pm. No promotion code required – flat fares will be visible upfront. uberPOOL will be available only within coverage area.